Dal bhat is a traditional South Asian and staple dish which is essentially rice (bhat) and lentil soup (dal). 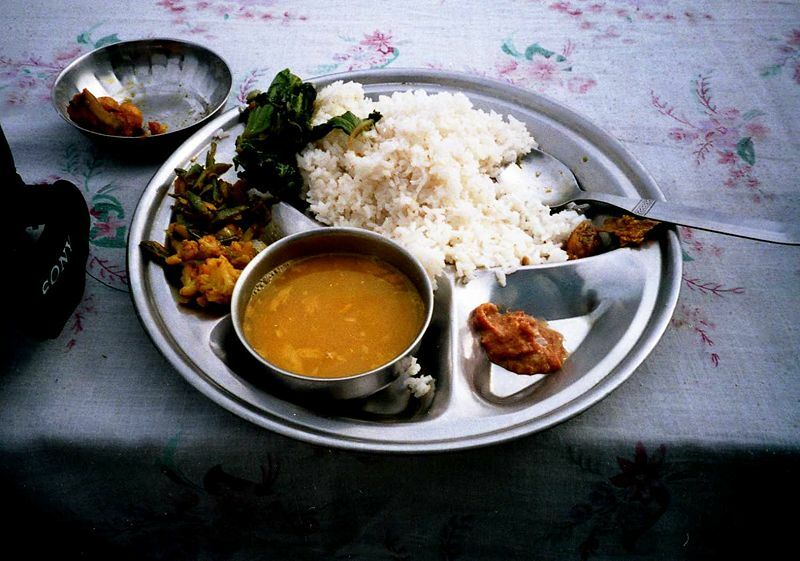 This is a common dish in South Asian countries, especially Nepal. Generally eaten twice a day with another (usually spicy but sometime bitter or sour) dish called tarkari which can be either vegetarian (vegetable tarkari) or non-vegetarian, usually depending on whether the day is a celebration of some kind. The recipes vary by locality, ethnic group, family, as well as the season. Dal generally contains lentils (different types are used according to taste), tomatoes, onion, chili and ginger along with herbs and spices such as coriander, garam masala and turmeric. Add a handful of coriander to the soup. Cook rice from cold water. Pour dhal over the top of rice and serve.